Mate (pronounced IPA: [ˈmate]—Mah-tay—with the accent on the first syllable) is a tea-like infusion, containing stimulants including caffeine, prepared by steeping dried leaves of yerba mate (Spanish) / erva-mate (Portuguese) (Ilex paraguariensis) in hot water. It is the national drink in Argentina, Paraguay, and Uruguay, and drinking it is a common social practice in parts of Brazil, Chile, eastern Bolivia, Lebanon, and Syria. Mate is an example of the use of plants to produce a delicious and unique beverage. The traditions of how to prepare and serve this drink reveal ingenuity in making use of other naturally available items, such as gourds for vessels. The drinking of mate has social significance, engendering feelings of harmony, unity, and a sense of close friendship that goes far beyond simple physical enjoyment of the drink. Mate (also known as Chimarrão in Brazil) is served with a metal straw from a shared hollow calabash gourd. The straw is called a bombilla in Latin American Spanish, a bomba in Portuguese, and a masassa in Arabic. As with other brewed herbs, yerba mate leaves are dried, chopped, and ground into a powdery mixture called yerba. The bombilla acts as both a straw and a sieve. The submerged end is flared, with small holes or slots that allow the brewed liquid in, but block the chunky matter that makes up much of the mixture. A modern bombilla design uses a straight tube with holes, or spring sleeve to act as a sieve. 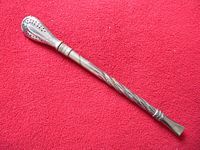 The straw is traditionally made of silver. Modern commercially available straws are typically made of nickel silver, called Alpaca, stainless steel, or hollow-stemmed cane. The gourd is known as a cuia or a guampa. However, "tea-bag" type infusions of mate (mate cocido) have been on the market in Argentina for many years. The drink has a pungent taste like a cross between green tea and coffee, with hints of tobacco and oak. Some drinkers like to add sugar or honey, creating mate dulce (sweet mate), instead of sugarless mate amargo (bitter mate). It is considered bad for the gourd (especially for the natural—squash or wood—ones) to be used for mate dulce so it is normal for households with drinkers of both kinds to have two separate gourds. Calabash gourd used for mate. Traditionally, natural gourds are used, though wood vessels, bamboo tubes, and gourd-shaped ceramic or metal (stainless steel or even silver) containers are also common. Gourds are commonly decorated with silver, sporting decorative or heraldic designs with floral motifs. Both the wood vessels and the gourds must undergo "curing" to acquire a better taste before being used for the first time and to ensure the long life of the gourd. Typically, to cure a gourd, the inside is first scraped with the tip of a bombilla to remove loose gourd particles. Mate herb and hot water is added next, and the mixture poured into the gourd. The mixture is left to sit overnight and the water is topped off periodically through the next 24 hours as the gourd absorbs the water. Finally the gourd is scraped out, emptied, and put in sunlight until completely dry. Yerba mate growing in the wild. The Guaraní (Guarani, in Brazilian Portuguese) people started drinking mate in the region that now includes Paraguay, southern Brazil, north-east Argentina, and Uruguay. The Guaraní have a legend that says that the Goddesses of the Moon and the Cloud came to the Earth one day to visit it but they instead found a Yaguareté (a jaguar) that was going to attack them. An old man saved them, and, in compensation, the Goddesses gave the old man a new kind of plant, from which he could prepare a "drink of friendship." This drink is what is now enjoyed as mate. The method of preparing the mate infusion varies considerably from region to region, and it is hotly debated which method yields the finest outcome. However, nearly all methods have some common elements: The gourd is nearly filled with yerba, and hot water (typically at 70 °C (158 °F)–80 °C (176 °F), never boiling) is added. The most common preparation involves a careful arrangement of the yerba within the gourd before adding hot water. 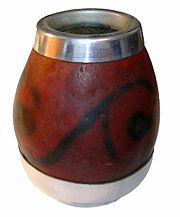 In this method, the gourd is first filled one-half to three-quarters of the way with yerba. After that, any additional herbs may be added for either health or flavor benefits; a practice most common in Paraguay, where people acquire herbs from a local yuyera (herbalist) and use the mate as a base for their herbal infusions. When the gourd is adequately filled, the preparer typically grasps it with their full hand, covering and roughly sealing the opening with their palm. Then the mate is turned upside-down, and shaken vigorously, but briefly and with gradually decreasing force, in this inverted position causing the finest, most powdery particles of the yerba to settle toward the preparer's palm and the top of the mate. 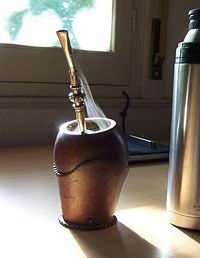 Once the yerba is settled, the mate is carefully brought to a near-sideways angle, with the opening tilted just slightly upward of the base. The mate is then shaken very gently with a side-to-side motion. This further settles the yerba inside the gourd so that the finest particles move toward the opening and the yerba is layered along one side. The largest stems and other pieces create a partition between the empty space on one side of the gourd and the lopsided pile of yerba on the other. 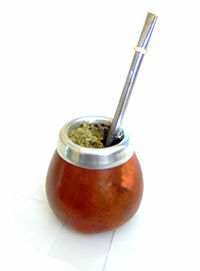 After arranging the yerba along one side of the gourd, the mate is carefully tilted back onto its base, minimizing further disturbances of the yerba as it is re-oriented to allow consumption. The angled mound of yerba should remain, with its powdery peak still flat and mostly level with the top of the gourd. 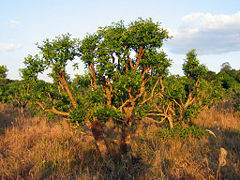 A layer of stems along its slope will slide downward and accumulate in the space opposite the yerba (though at least a portion should remain in place). Many people choose to pour warm water into the mate before adding the bombilla, while others insist that the bombilla is best inserted into dry yerba. Wetting the yerba by gently pouring cool water into the empty space within the gourd until the water nearly reaches the top, and then allowing it to be absorbed into the yerba before adding the bombilla, allows the preparer to carefully shape and "pack" the yerba's slope with the bombilla's filtering end, which makes the overall form of the yerba within the gourd more resilient and solid. Dry yerba, on the other hand, allows a cleaner and easier insertion of the bombilla, though care must be taken so as not to overly disturb the arrangement of the yerba. Such a decision is entirely a personal or cultural preference. The bombilla is inserted with the thumb on the upper end of the bombilla, at an angle roughly perpendicular to the slope of the yerba, so that its filtering end travels into the deepest part of the yerba and comes to rest near or against the opposite wall of the gourd. Two mate gourds ready to drink. If the bombilla was inserted into dry yerba, the mate must first be filled once with warm water as above, then be allowed to absorb it completely (which generally takes no more than two or three minutes). Treating the yerba with cool water before the addition of hot water is essential, as it protects the herb from being scalded and from the chemical breakdown of some of its desirable nutrients. Hot water may then be added by carefully pouring it, as with the cool water before, into the cavity opposite the yerba, until it reaches almost to the top of the gourd when the yerba is fully saturated. Care should be taken to maintain the dryness of the swollen top of the yerba beside the edge of the gourd's opening. Once the hot water has been added, the mate is ready for drinking, and it may be refilled many times before becoming washed out (lavado) and losing its flavor. When this occurs, the mound of yerba can be pushed from one side of the gourd to the other, allowing water to be added along its opposite side; this revives the mate for additional re-fillings. Steaming yerba mate infusion in its customary gourd. When people gather to drink mate something magical happens. It is a simple, daily custom and yet it has all the characteristics of a ceremony. Like any ceremony it has rites which are carefully performed in the same way, day after day. It is a moment of leisure with friends and family. In the country, the gauchos sit together around the fogón (the campfire), sipping their mate after a long day's work. Tiredness breeds silence and silently the mate gourd circles from hand to hand. And then, slowly, conversation starts, people come closer together, confidences are exchanged. The mate ceremony resembles the American rite of the calumet, the pipe of peace. There too, the pipe goes from hand to hand, completing the circle, offering hospitality and goodwill. 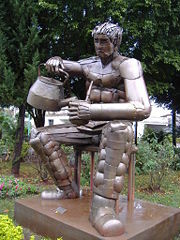 Mate is drunk by everybody: It is a drunk by the trucker and his companion in the loneliness of the long, never-ending routes (they use a vessel with a wide mouth into which it is easy to pour the hot water in spite of the jolts along the track); by students, when studying; by workers during their midday rest; at home for breakfast or on any other occasion, rain or shine, in summer or in winter. (Hoss de le Comte 1999). One person (known in Spanish as the cebador) assumes the task of server. Typically, the cebador fills the gourd and drinks the mate completely to ensure that it is free of particulate matter and of good quality. In some places passing the first brew of mate to another drinker is considered bad manners, as it may be too hot or too strong; for this reason the first brew is often called mate del zonzo (mate of the fool). The cebador subsequently refills the gourd and passes it to the next drinker who likewise drinks it all, without thanking the server. The ritual proceeds around the circle in this fashion until the mate becomes lavado ("washed out" or "flat"), typically after the gourd has been filled about ten times or more depending on the yerba used (well-aged yerba mate is typically more potent, and therefore provides a greater number of refills) and the ability of the cebador. When one has had his fill of mate, he or she politely thanks the cebador passing the mate back at the same time. In Uruguay and Brazil the traditional cuia is usually large with a corresponding large hole. In Argentina (especially in the capital, Buenos Aires) the cuia is small and has a small hole, and people sometimes add sugar for flavor. 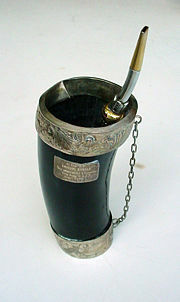 In Bolivia and Peru, mate de coca is often sipped instead of ordinary mate. In Uruguay and Argentina it is common to see people walking around the streets toting a cuia and a vacuum flask with hot water. In some parts of Argentina, gas stations sponsored by yerba mate producers provide free hot water to travelers, specifically for the purpose of drinking during the journey. There are disposable mate sets with a plastic mate and bombilla, and sets with a thermos flask and stacking containers for the yerba and sugar inside a fitted case. In Uruguay there is a national law that prohibits drinking mate while driving, because of the danger of being scalded with hot water and so distracting them. In Brazil, traditionally prepared mate is known as chimarrão, although in areas near the border with Uruguay the word mate is also used. Mate is often toasted with sugar and prepared in a similar manner to tea, a custom that originated in Paraguay. Supermarkets, restaurants and fast food chains sell "tea bags" and prepacked "iced tea" packages and bottles. In Argentina, mate cocido (cooked mate) is made with a teabag or leaves and drunk from a cup or mug, with or without sugar and milk. By the beginning of the twenty-first century most urban Chileans were not mate drinkers, but travel narratives such as Maria Graham's Journal of a Residence in Chile originally from 1824, show that there is a long history of mate drinking in central Chile. Many rural Chileans drink mate, in particular in the southern regions, particularly Chiloé and Magallanes, perhaps due to the influence of neighboring areas of Argentina. In some provinces of the Middle Eastern countries of Syria and Lebanon it is also common to drink mate. 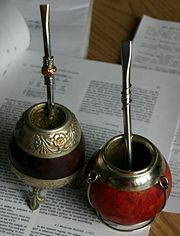 The custom of drinking mate came from Arab emigrants from South America. Syria is the biggest importer of yerba mate in the world, importing 15,000 tons a year. It is mostly the Druze community in Syria and Lebanon who maintain the culture and practice of mate. In the early twenty-first century mate grew in popularity in North America to about five percent of the overall natural tea market. Bottled iced mate became available, particularly in California. Tereré is an infusion of yerba mate, similar to mate but prepared with cold water (rather than with hot water), and in a slightly larger vessel. It is ubiquitous in Paraguay an is found also in northeastern Argentina and southern and western Brazil. First invented by the Guaraní natives in Paraguay and western Brazil (Mato Grosso do Sul), who called the infusion ka'ay, where ka'a means herb and y means water. Tereré was spread by the dwellers of that region, and for centuries was a social beverage. People usually prepare one jar of natural water and a cuia (Portuguese) / guampa (Spanish)—gourds made from animal horns, usually made ox—with a bomba (Portuguese) / bombilla (Spanish) which is shared among the group of people. Since Paraguay and Mato Grosso do Sul have a very hot climate, this drink is very refreshing. Additionally, it is an important ritual signifying trust and communion. People in Paraguay take their tereré with water infused remedial herbs such as mint "menta-i" or lemongrass. When not prepared with plain cold water, citrus fruit juices are usually used, although this practice varies depending on the region. While mixing fruit juices with tereré is common in northeastern Argentina, Brazil, and Paraguay. Lime and orange juices are used in Argentina and Paraguay, while in Brazil lime and pineapple juice are more common. Tereré taken with juice is commonly called tereré ruso (Russian Tereré) due to the fact that this practice is more common with Slavic immigrants than with Spanish- and Guarani-speaking Paraguayan people. In some parts of Argentina, Tereré is seen as a lesser form of mate, and its drinking hardly ever follows the traditional ritual. In Paraguay, by contrast, tereré is considered highly superior to any other drink especially on a hot day. As a popular remedy, the people of Paraguay heal various ailments such as headache, stomachache, and diarrhea by adding medicinal herbs into the water. The act of drinking Tereré is more than just that, however. It is often used as a reason to share and chat with a partner, meet new people, or just for meditation when drinking alone at the end of the day. Everage, Laura. 2004. Trends in Tea. The Gourmet Retailer, November 1, 2004. Retrieved December 11, 2008. Graham, Maria, and Jennifer Hayward (ed.). 2003. Journal of a Residence in Chile During the Year 1822, and a Voyage from Chile to Brazil in 1823. University of Virginia Press. ISBN 081392216X. Hamre, Bonnie. 2008. Yerba Mate - Background and Preparation. South America Travel, About.com. Retrieved December 11, 2008. Hoss de le Comte, Monica G. 1999. The Mate. Maizal. ISBN 9879789903. Paajanen, Sean. 2008. Yerba Mate. Coffee/Tea, About.com. Retrieved December 11, 2008. This page was last modified on 31 August 2018, at 15:03.